Dragonfly pendant. This was designed and made as a bespoke commission for an overseas client. 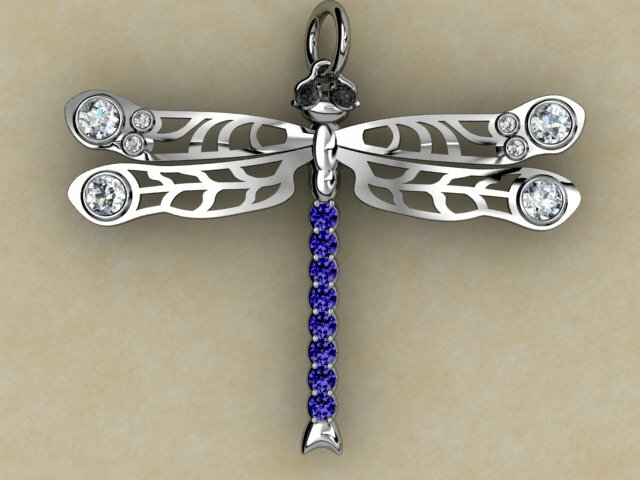 He wanted the design of a dragonfly, which incorporated tanzanite and diamonds. He wanted the delicacy of these exquisite creatures to be reflected in the piece. The eyes are black diamonds. The loop bail is one of our hinged and diamond-set loops. This enables the pendant to be clipped onto any type of necklace. 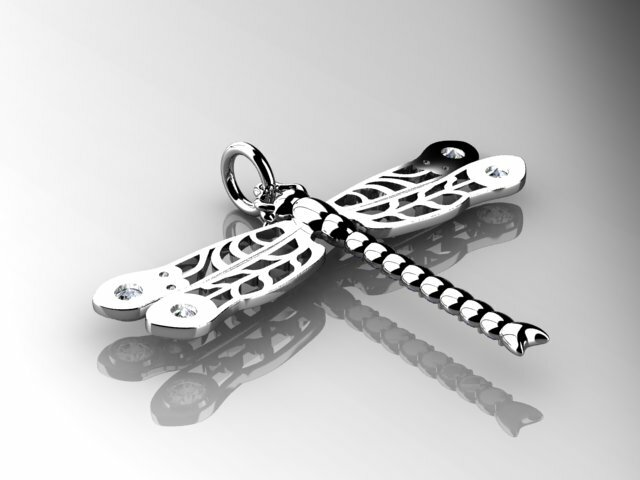 The dragonfly pendant is about 45mm long and made in platinum. The underside of the insect’s tail is carved in ribbed sections, like the real beasties. I based the lattice work design from photographs of dragonflies, but I stylised the pattern with an Art Deco character for uniformity and originality. Our pieces are unique, one-offs, which means the wearer knows they have something exclusive and completely original. I will often produce a number of pages, full of design ideas when designing a piece of jewellery. The work that goes into every commission is very extensive, even before the final design solution is reached. This is why we charge a small design deposit, to cover some of the time taken to produce the watercolour painted choice of original ideas. Our designs remain our copyright, but we generally won’t repeat the exact format again. Once the design has been chosen from the range of ideas that I give, then invariably, the choice is drawn up in our design software. This performs a number purposes: We are able to clarify any areas in the design that need more detail. We are able to identify and resolve manufacturing difficulties. We can illustrate how the final piece of jewellery will look photographically and show the piece from all angles. The computer file is then converted into numerical language and transferred to either our 3D printer or our CNC machine. Both of these methods produce a wax model. From the wax, we can take a once only mould, to cast the item in the required precious metal. Tiny blemishes in the metalwork, or characteristic traits in stones, add character and identifiable ‘birthmarks’ which you don’t get in mass produced items.